Moto E Review: Is this the Best Android for Budget Buyer? Moto E Review: Hope for the Budget Buyer or Much Ado About Nothing? As the 6000+ user reviews on Flipkart will tell you, Moto E is a good phone. But like most things in life, the devil is always in the details. So is this universally well praised budget marvel for you? Let’s find out. Note: This post is geared towards the Indian market but the points made in the review stand true on a global scale. If you’re from India, you can buy Moto E for Rs 6,999 on Flipkart (White, Black). If you’re from the US you can choose between Motorola’s official site or Amazon for a $129 unlocked Moto E.
Moto E is powered by Qualcomm Snapdragon S200 dual-core processor, Adreno 302 GPU and 1 GB RAM. Lighting up your life is a 4.3 inch screen with 540 x 960 qHD resolution that works out at 256 PPI. The phone comes with 4 GB of internal storage ( of which only about 2.2 GB is usable) and a MicroSD expansion slot which supports cards up to 32 GB. On the back of the device you’ll find a 5 MP shooter without flash below which sits the now ubiquitous dimple featuring the Motorola logo (which doesn’t feel as good as the Moto G’s, thanks to the thinner plastic). There’s no front facing camera to speak of. On display: Moto E’s bad internal construction. Internal wiring is exposed, as you can see. The phone looks like a derivative of Moto G and X. It’s not nearly as good to hold as the Moto G. At 12.3 mm, it’s a bit on the thicker side. Moto could have put in more time designing the hardware. The middle part of the back, the part that curves out seems hollow from inside and occasionally creaks. Moto E’s body is made entirely out of plastic but not the exciting kind like the Galaxy S5. Here it’s just plain old white plastic sheet to speak of. Thankfully you can swap the back panel for something a bit more exciting. The Moto E is one of those phones that looks good in the adverts but it’s a whole different story once you pick it up. Thanks to a screen that’s not ginormous, using Moto E single handedly is not a big issue. But it’s evident from the thick bezels and the empty space at the top and the bottom that it could have been much better. Moto E comes loaded with the latest and greatest Android 4.4.2 KitKat. Software wise, there’s not much to speak of. Moto E’s interface is mostly stock Android (there is no proprietary skin overlay). The only additions are Moto Migrate and Assist apps that, unlike bloatware from Samsung phones, are actually helpful. Stock Android is the best kind of Android. Performance wise there’s not much difference between Moto E and more expensive devices like the G. At least when it comes to things like scrolling and app launches. To test it out I went to the heaviest app on all of Android land – Facebook. If you can use Facebook smoothly on a phone, you can do pretty much anything on it. Moto E stutters when scrolling, sure, but not more so than other budget android phone out there. Related: Not convinced Moto E has what it takes to be your primary phone? Check out the 9 reasons why it would be the perfect backup phone. Moto E has a qHD screen. In a world where anything that’s not at least 720p gets criticized, the Moto E’s screen stands rather proudly. It’s not as bright or clear as Moto G’s display but when you compare it with other phones in the 7k range, the Moto E comes at top. While the screen displays text and images clearly, the color reproduction is far from optimal. Facebook’s now legendary blue color looks nothing like itself on the Moto E and the faded whites reminded me of the Galaxy Nexus days. The screen comes wrapped in Corning Gorilla Glass which should protect it from unwanted scratches. There’s also a water-resistant splash guard but I wouldn’t try using it under a running faucet. When you’re talking about a phone that sells for $129 or Rs 6,999, you can’t expect much. Moto E still manages to fit in as much as possible in that tiny space. Things like 1 GB RAM are unprecedented at that price. But it’s important to know where Moto E is lacking before making that purchase. Moto E comes with 4 GB of internal storage (there is no higher tier). Of which only about 2.2 GB is usable. 2 GB these days either means a couple of photos, essential apps and a few music albums. Or it means onehigh quality game like NFS Most Wanted or Real Racing 3. The limited storage leads us to the next problem. For security reasons Android 4.4 doesn’t allow apps to directly access and alter SD card storage in its entirety. You can’t move an entire game from internal storage to SD card including the app and user data and expect it to work, like you used to a year ago. This presents a unique problem that not many users think of. Apps that have move to SD card option enabled in KitKat (and a lot of them don’t) only have access to the folder that the app created for its own storage and nothing else. From App manager in Settings you can move certain apps and data to the SD card but even then it’s just data and media. Installed apps still need to live on internal storage. This is one of those rare moments where running the latest software can be a disadvantage. Can you live with just 2 GB of storage for apps? That’s the question you need to answer before buying this phone. This 5 MP sans flash shooter clearly belongs to a 7K phone. In a phone where most of the hardware components feel like a category above, the camera brings you back to reality. Instead of the usual tap to focus we’re all used to in mobile cameras, the E’s camera app only lets you control the exposure and HDR. Dragging the exposure circle around is the only control you have over the image quality. But it’s the one you should use wisely, for overexposed images turn out to be pretty bad ones. The images can be a tad grainy sometimes, especially if there’s not enough natural light to speak of. For a tiny phone, Moto E has surprisingly good battery life. This one clocks in at 1980 mAh. In my use it lasted well beyond the one day limit that’s average for most Android phones these days. You have the lean dual-core processor and the small screen to thank for that. If you are willing to spend the money, go for Moto G. It is my secondary phone and a joy to use on every occasion. Everything the Moto E is good at, the G does better. It feels better in your hands, the screen is a delight to use and that quad-core processor means there won’t be any performance hiccups. Expandable storage is the only major difference between them. But as I’ve explained above, it went from being Moto E’s strongest suit to being the biggest disadvantage. Yes, the G doesn’t have expandable storage but that 16 GB model should let you install and run a lot of heavy apps and games all at once. At 7k you don’t have many big brand options other than the Moto E. I’d suggest you stay away from the Nokia X as much as possible (the X2 looks better but it’s still not quite there yet). The biggest competitor to Moto E is the Micromax Unite 2. It sells for exactly the same price (at the time of writing) but fails to impress in some key areas. It has a 4.7 inch screen running at just 480 x 800 resolution (lower than the Moto E). While it has a quad-core processor, it’s a Mediatek. Also, with 4 GB of internal storage and KitKat on board, it has the same memory problem as the Moto E.
Other than the few things that could be a deal breaker for you, there’s not much to complain about the device. I’ve played games on it, used it to test apps for reviews on this site, spent a lot of time watching YouTube videos and doing things people who’ll buy this phone are likely to be doing. And honestly, I’m impressed. I’m impressed that this is a Rs 6,999 phone that runs latest generation software. That it’s almost half the price of Moto G but feels just as fast – both in app performance and the touch response. I’m impressed with Moto for going in a direction which was best for the customers, not for their own agenda ( hint: Nokia X). While I was playing around with Moto E tearing it apart from inside out, I was looking for things that were wrong – things that I could write how to fix easily. I looked up what Moto E owners were saying. 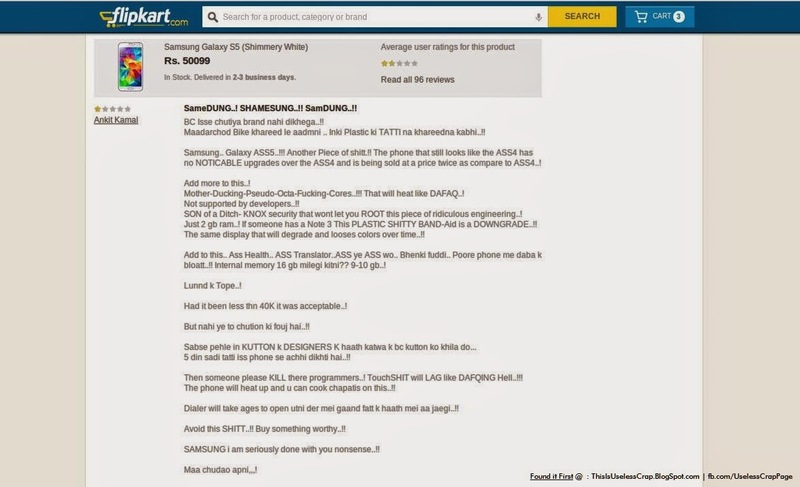 I even read through some of the Flipkart’s reviews (always entertaining). But at the end, other than the camera app, there wasn’t much that I uncovered. Compare that to the Galaxy S5 and you get lengthy posts about making the phone usable. While that’s good praise for this device, it doesn’t mean the phone is perfect in every way. You’ll have to think long and hard about its pitfalls before even considering ordering one, that too online. Most of the things wrong with the S5 and the Nokia X stem from poor software implementations ( which in the Moto E is ironclad). But software issues are fixable, hackable. Physical limitations like the astoundingly tiny storage space and the poor construction are not. If you want to buy the best phone you can get under Rs 7,000, just buy the Moto E*. *Unless you just can’t live on 2 GB of internal storage and no flash.